Elliptical Handhole & Manhole Assemblies – Clark Kennedy Co. Inc. The self-sealing yoke and bolt manway provides the most economical and reliable access to pressure vessels. Yokes are designed for the positioning and holding of the covers only. 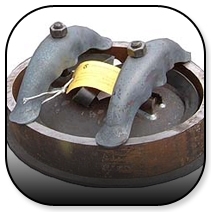 Gasket sealing is accomplished by the application of internal pressure. When cover assemblies are ordered without rings, customers are requested to specify the bolt length required. Handhole and manhole covers are designed and fabricated in accordance with the ASME code. 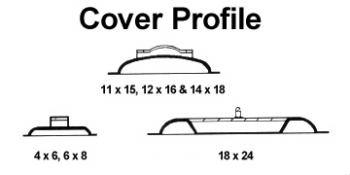 (See cover profile drawing) The size and pressure temperature rating are stamped on all covers where space permits. All sizes shown are in inches. The nominal size dimensions are the inside dimensions of the opening into which the covers will be installed. Covers are stocked in SA516 Grade 70 steel. They can also be supplied in stainless steel (grades 304, 304L, 316 and 316L). Our gasket stock includes red rubber, neoprene. Gaskets in other materials are available on request. All covers are registered in Canada.